Food deserts and fresh food access aren’t the problem. Poverty, not obesity, makes people sick. Getting fresh fruits and vegetables into low-income neighborhoods doesn’t make poor people healthier. 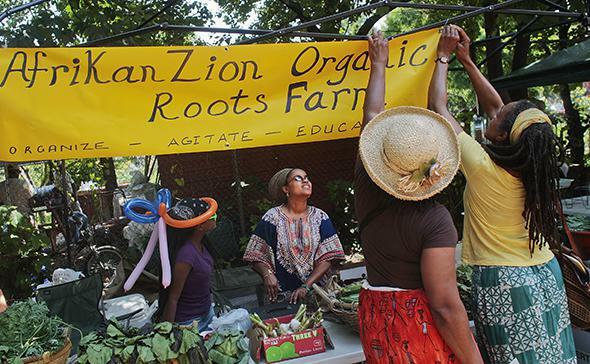 Food vendor Daphina Jacobs (center) and friends set up a booth at the Hattie Carthan Community Market on its first day of selling locally grown organic produce in the Bedford-Stuyvesant neighborhood of Brooklyn on July 11, 2009. A dozen recently and currently incarcerated women gathered in a classroom across the street from their San Francisco jail and considered a bulb of fennel. Crowded around a few small tables, the students peppered their teacher, Vera Pittman, with questions. “It’s fronds, not hair,” said Pittman, walking the fennel to each table so everyone could inhale its licorice-like smell. The fennel 101 lesson was part of a cooking class called Soul Food, a program started by a local chef and aimed at teaching low-income women how to cook and eat fresh and local foods. Many women in the class are from the Bay Area’s poorest neighborhoods, places where people suffer more often from illnesses that better diets may delay or prevent, including high blood pressure, diabetes, and cardiovascular disease. They will die, on average, years earlier than wealthier Americans. Since 2004 there’s been a sharp spike in the number of programs like Soul Food that are aimed at reducing such health disparities by making fresh food more accessible to low-income people. These programs have earned the support of politicians and the first lady, who’s made fresh food initiatives a cornerstone of her campaign against childhood obesity. It’s easy to understand why Michelle Obama and other influential figures have promoted fresh food initiatives: Bringing a bounty of fresh produce to impoverished “food deserts” is a lovely idea. But the idea isn’t borne out by evidence. Study after study has shown that the fresh-food push does nothing to improve the health of poor people, who continue to live markedly shorter and sicker lives than better-off Americans. British politicians introduced the idea of food deserts in the mid-1990s, adopting the term after a few preliminary studies suggested a link might exist between distance to a grocery store and the diets of poor people. The idea had caught on in the U.S. by 2004, when Pennsylvania passed a Fresh Food Financing Initiative, which offered grants and loans to supermarkets willing to open in distressed neighborhoods and helped smaller stores expand their supplies of fresh food. Twenty-two states now have some version of fresh-food financing and there are countless local and nonprofit programs, including cooking and nutrition classes (like Soul Food) designed to get more fresh fruits and vegetables into the lives of poor people. The Healthy Food Financing Initiative was more than a victory for the food movement. Aimed in large part at low-income city neighborhoods, which tend to be disproportionately black and Latino, it was—and is—the Obama administration’s most visible policy designed to help poor people of color. The Healthy Food Financing Initiative has distributed more than $500 million to increase fresh food access—at the same time that funding for food stamps, a program proven to improve the lives of people living in poverty, was cut to pre-stimulus levels. Since the reductions, food stamp recipients have received just $1.40 per meal per family member. Unfortunately, more fresh food closer to home likely does nothing for folks at the bottom of the socioeconomic ladder. Obesity levels don’t drop when low-income city neighborhoods have or get grocery stores. A 2011 study published in the Archives of Internal Medicine showed no connection between access to grocery stores and more healthful diets using 15 years’ worth of data from more than 5,000 people in five cities. One 2012 study showed that the local food environment did not influence the diet of middle-school children in California. Another 2012 study, published in Social Science and Medicine, used national data on store availability and a multiyear study of grade-schoolers to show no connection between food environment and diet. And this month, a study in Health Affairs examined one of the Philadelphia grocery stores that opened with help from the Fresh Food Financing Initiative. The authors found that the store had no significant impact on reducing obesity or increasing daily fruit and vegetable consumption in the four years since it opened. Lee also notes in her study that, on closer inspection, food deserts don’t actually exist in the U.S., at least not as a national problem—on average, poor neighborhoods have more grocery stores than wealthier neighborhoods. Even before Obama’s Healthy Food Financing Initiative was announced in 2010, studies suggested that the food desert explanation for obesity wasn’t right. A report from Department of Agriculture researchers presented to Congress in 2009 also showed more grocery stores in poor neighborhoods. In 2012, USDA researchers crunched the data again and found once more that low-income neighborhoods had more—not fewer—grocery stores. Why, then, do campaigns like the Healthy Food Financing Initiative persist? The push for fresh food is usually considered a progressive cause, connected as it is to criticisms of processed foods’ effect on health. And the most prominent voices against the fresh-food push have been conservative, from Rush Limbaugh to Reason magazine. But look a little closer, and fresh-food financing initiatives are a pretty conservative idea. They offer a market-based opportunity for individuals to make better choices about health, leaving the impression that people living in poverty get sick for reasons that are within their control. In fact, researchers who focus on health disparities have suspected for decades that people who live in poverty die early because of the stress of poverty itself rather than the poor health choices low-income people make. That’s not to say that poor people don’t make decisions about diet and exercise, but in general they are preoccupied with very different choices than wealthier people are: Should I pay my electricity or my water bill? Can I pay my rent and buy my kid a pair of school shoes? The immediacy of these pressures may make it more difficult to think about how eating choices today will affect health 10 or 20 years from now. But more importantly, the constant calculus of survival will wear down mind and body and deteriorate health over years. Bruce McEwan, one of the pioneers of research in the biology of health inequality, coined the term “allostatic load” to describe the cumulative wear and tear of stress reactions over time. Stress reactions, like floods of adrenaline and cortisol and increased blood pressure, are helpful as short-term reactions to dangerous or challenging situations. But if stress reactions are constant, they create physiological conditions that damage the body. “One of the things having an elevated sympathetic response is that you have an inflammatory tone in the body,” McEwan explains. “Inflammation underlies all of the diseases of modern life—from cancer to depression to neurological diseases.” Those diseases of modern life also include heart disease, hypertension, and diabetes—illnesses we typically associate with poverty. But the implication of McEwan’s research—that poverty itself is making people ill—is not one that Americans are prepared to accept. Instead, we build supermarkets, finance green grocer carts, and teach former inmates about fennel, feeling like we’re promoting a progressive effort to improve the plight of the disadvantaged. Meanwhile, poor people are living shorter, sicker lives, with no helpful new policy in sight.